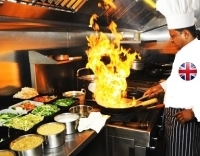 To keep their business going, Indian restaurant owners in the Britain have prepared a 75 page document requesting the UK Government to plan a one year visa for chefs coming from their home country. There are totally 12000 curry restaurants in the United Kingdom if the chefs from India are not imported that would affect the business in the long run, and that may lead to the closure of the business in the United Kingdom. The comprehensive document has been submitted to the UK Government. The British Curry Awards founder Enam Ali said that the immigration is being used to gain the political mileage in the UK, but that is impacting the whole curry industry in the great nation. The stringent visa procedure does not allow expert chefs from the Non-European countries to come and settle in the United Kingdom. The group of restaurant owners urged the United Kingdom Government to introduce a short term visa that would not be a burden to the United Kingdom’s economy. Unless the United Kingdom Government makes a special permit respecting the demands of the industry, it is really going to be tough to survive in the industry. It 's hard to find the Indian style of cooking skills from the European Union nationals. The United Kingdom introduced major reforms to the immigration programs. The visa fee hike for making the immigration agency self funded and various sanctions on work visas also worried many Indians and the foreign nationals working with the Tier 2 visa category.